Day 7: Back to work. 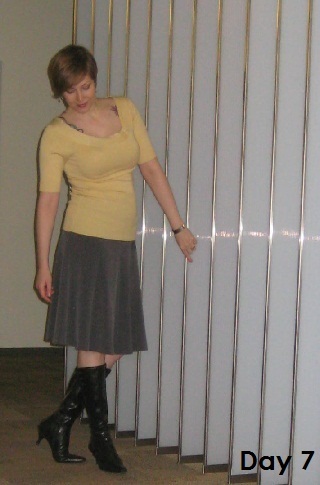 My employer doesn’t have a dress code, but I like being pulled together so I paired this sunny sweater with a gray skirt. To me, the top has a retro feel. I got it for a song too. 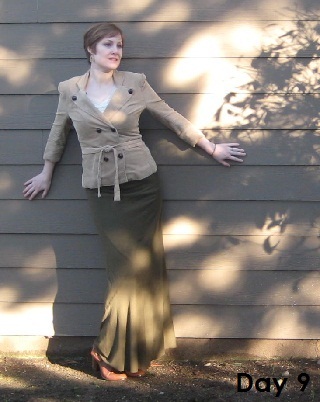 The skirt is from a clothing exchange. If you’ve never hosted one or been to one, you’ve got to try it! I’ll post on that topic separately soon. Day 8: Today is Blazer Day! The brainchild of Everybody, Everywear. What a super idea. I love blazers anyway, but it was great to make sure I included at least one blazer in the 30 for 30 Challenge. I paired mine with long and lean jeans. I think they work: They really create a nice long, lean silouette. Day 9: Today I awoke to something bright shining in my eyes. I looked outside and there was a glowing yellow ball in the sky—oh, it’s the sun! It made a rare appearance; the sun doesn’t visit Seattle much this time of year. 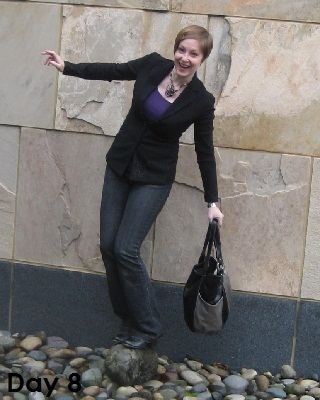 To celebrate, I wore a 3/4-length sleeve—you guessed it—blazer! I’m still on my blazer high from yesterday and thought I’d make it two for two.